31st December 1720, Palazzo Muti, Rome, Italy. Charles was the son of deposed and uncrowned King James the Third of England known as “The Old Pretender” and grandson of King James the Second. Christened Charles Edward Louis Philip Casimir Stuart. He was nicknamed Bonnie Prince Charlie in popular legend due to his good looks. Catholic Governess Mrs Sheldon favoured by his mother was removed in favour of a protestant tutor James Murray chosen by his father. 1744: With the help of the French King Charles’ father began an attempt to regain the British Royal throne for the Catholic Stuart cause from the ruling Hanoverians. Young Charles was put in charge of the French invasion forces, although bad weather and a build up of British naval forces put the expedition on hold. 1745: Bonnie Prince Charlie left France on 5th July with two ships. One is badly damaged by a British warship and he is advised to turn back but he continues on. Lands on the west coast of Scotland on the Hebridean Island of Eriskay where he is met by Macdonald of Boisdale who tells him to go home, “I am come home, Sir” he replies. 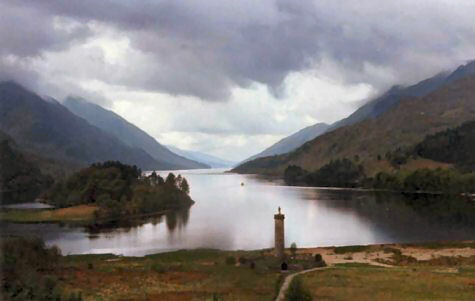 On 19 August he raised his standard at Glenfinnan but unfortunately not many clansmen had turned up. Then 700 Cameron men arrived and finally he began to organise a small force of about 1,500 Highlanders who had rallied to his Jacobite cause. The Government puts a £30,000 bounty on his head for his successful capture which was a large fortune in those days and represents the threat they thought he posed. In September he successfully occupied Edinburgh and destroyed the Hanoverian Government army led by John Cope at the Battle of Prestonpans (21st September), just outside Edinburgh. He then crossed over the border into England on 1st November with a force of about 6,500 men determined to go to London despite his general’s desire to wait for reinforcements. Carlisle surrenders to his army on 15th November where the terrified townspeople believe that the Highlanders eat children. They eventually marched south as far as Derby. By now there was panic in London with the King seriously thinking of packing up and returning to Hanover. The march began to slow as English Jacobites did not flock to the cause as was expected. The backing from France of men and money also did not materialise. Faced by a Government army of nearly 30,000 men he decided to retreat back to Scotland. 1746: Bonnie Prince Charlie won a victory against the Government forces at the Battle of Falkirk on 17th January. On 16th April the two armies finally met after much maneuvering on the battlefield at Culloden where he was defeated by the Duke of Cumberland. The fight lasted just over an hour and the government army contained many Scottish troops as well as English. The Duke received his nickname of “The Butcher” not for the battle itself but for the ferocity with which his troops hunted down people they thought were active in the uprising. This massacre lasted for several weeks and killed several thousand people, including many innocent people. Even though many more Scots had fought on the Government side Highland culture, language and dress was suppressed for many years to come as retaliation. He was taken to Portree on the Isle of Skye in June where he was disguised as a maid called Betty Burke, by Flora MacDonald. He escaped by sea back to France on 9th September and landed in Brittany. There he was entertained by the French court until he was asked to leave after the Peace of Aix-le-Chapelle. 1750: Bonnie Prince Charlie actually visited London in disguise and tried thereafter to interest several European governments to support him. 1760: Declared himself a protestant in the hope that it would help his cause. 1753: Birth of a daughter Charlotte to his mistress Clementina Walkinshaw whom he created Duchess of Albany. 1765: By now his claims were not even being recognised by the Pope and other European Powers and he became something of a joke in international circles, finally descending into alcoholism. He retired to Florence. Good Friday 17th April 1772 to Louise, daughter of Gustave Adolphe, Prince of Stolberg-Gedern at the Marefoschi Palace in Macerata, Italy. (Later dissolved). 31st January 1788, Palazzo Muti, Rome, Italy. Tomb in the Cathedral of Frascati as the Pope forbad his burial in Rome (although he was later moved to St. Peter’s Cathedral in Rome). Holyrood House holds his pistol. West Highland Museum, Fort William holds relics. Kings Own Regimental Museum, Lancaster.